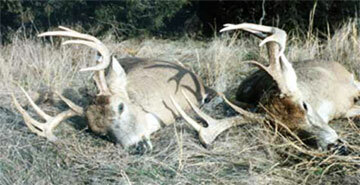 Iowas Muzzleloader deer hunting is the smallest minority activity in the Association. The available pictures reflect just how few hunt this season. Especially so in Iowa due to tag costs. That plus the non-resident portion, the majority of our hunters being out-of-state, are limited to the late December/January season when most have had their fill of deer hunting. Iowa muzzleloader deer hunting includes a split muzzleloader deer season that separates deer hunting for Iowa resident and non-resident deer hunters. The first muzzleloader season is an early 9-day season for residents only. It’s typically set for mid-October before the pheasant opener. Great day when two buddies tag out the same day. Congratulations to Matt and Eric! 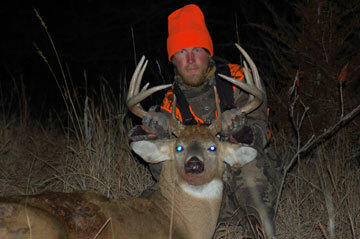 The second Iowa deer hunting season is for non-residents and it runs for over 20 days. It is usually set for the end of December running into January, which can be bitter cold, especially early in the morning and late in the evening. This is a great season to hunt as the bucks are well beyond the rut and back into herds seeking shelter in the wooded creek bottoms to wait out the winter temperatures. Food is not likely to be an issue on our southern lease land as snowfall levels will be less than other areas and the browse will be plentiful along the many miles of soft edge habitat along the farm fields and creek bottoms that make up many of our land lease holdings. Scouting these areas well before the season will easily identify the key localities where the bucks will seek shelter and that includes the trophy quality bucks that will no longer have any doe in season to pursue. A third season is an antlerless-only deer season is from Christmas time to early Jan.
All non-resident Iowa deer tags are by draw. The draw period is usually the month of May through the first week of June. With a viable point preference system of cumulative points awarded for unsuccessful draw years most hunters rarely go more than two points between successful tag draws. As long as the hunter continues to apply he can count on eventually getting a tag. There has been a past performance of increased likelihood of applicants receiving a muzzleloader tag over that of archery and shotgun. I would, again, like to thank you and the MAHA staff for putting together such a great hunting association. I tasted success for the second year in a row. Last year, I had success in [location deleted] and this year, I had success in [location deleted]. You provided excellent advice in reference to where trophy deer were located (saw some good deer on a scouting mission). Unfortunately, I never got to hunt any of the land that you recommended. The first two days of my hunt, I hunted some land that I had scouted two years previously. On the first morning, I spotted a nice 5 x 4. I watched him for about 15 minutes and decided to pass on him since it was day one. I did not see any deer after that encounter in the morning. That afternoon, at about 2 PM, I stalked up on another 5 x 4 that was bedded down out of the wind. I got to within 50 yards and watched him until 415 PM when he stood up to feed. I decided to pass on him as well. I wanted to hold out for a 5 x 5 or bigger. At about 420 PM, a large bodied 5 x 5 walked out and challenged the 5 x 4. After the loudest snort wheeze that I have ever heard, the smaller bodied 5 x 4 decided to exit the area. At that time, I decided to harvest the 5 x 5. 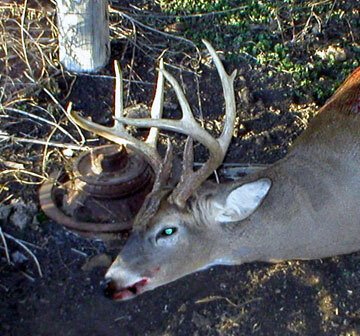 He definitely is not the biggest racked buck in [location deleted], but his body was huge. All of his tines were broken except for two. It will cost him some inches but the damage was minimal and gives him some great character. He had an eleventh point that was broken completely off the main beam. He also had some gouges in his back that were fresh. I would like to see the deer that decided to challenge this big guy. The temp was very cold (11 below wind chill) so the blood was frozen to his snout. I tried to wipe it off for the picture but failed miserably. Sorry about that. Anyway, thanks again for putting together such a great organization. I look forward to more success in the future. Let me know who I need to talk to about the landowner tag process. I am always interested. Muzzleloader deer hunters are a minority within this Association and the late muzzleloader season seems well after most have had their fill of whitetail hunts through other seasons in other states. What this does represent is another option available to the Association self guided hunter making yet one more state and its three available seasons open to experience. Regardless of who the deer hunter is, the reality is that any of us have only so much effort to expend and within the Association more deer hunting opportunity exists than that effort can usually cover. We may all like to think we deer hunt hard but the reality is that we do not hunt hard on all that we have open to us. Muzzleloader deer hunters that have concentrated within that one discipline have out performed those that also modern firearms or archery hunt. The issue it seems is not more days in the woods it is focus on a particular time of the season and the deer behavior within that period. The advantage of the late Iowa December deer season on Association leases is we have thousands of acres of corn, soybeans and winter wheat, some of which doesn’t get harvested until late December. Combined with crp grass brushy draws and timber, this is a perfect combination for quality late muzzleloader deer hunt. This is how it stands. Tags area available to draw, land is un-pressured and the bucks are there. All there is to do is to get the do it yourself Iowa hunter in the field to deer hunt. Never do we promote Mid-America Hunting Association as purely a trophy deer hunter organization. We promote quality hunting to that hunters’ level of enjoyment.